The brothers Albert and Leopold Stickley founded the original Stickley Brothers Company in 1891 in Grand Rapids, Michigan. They also established operations in England which first exposed them to the European arts and crafts movement that was to prove so influential for all the brothers. Stickley Brothers manufactured simple yet finely crafted furniture in the arts and crafts style for the European market, but soon they were also importing these styles into the United States as U.S. consumers developed a more sophisticated taste in design. Gustav (1858-1942), the best known of the Stickley Brothers, was born in Wisconsin as the son of German immigrants. Early in his teens, Gustav began working with his father as a stone mason where he first began to appreciate crafts. Gustav began working in his uncle Jacob Schlaeger's chair factory in Brandt, Pennsylvania in 1870, leaving in 1884 to establish his own business with his two brothers Charles and Albert in Binghamton, NY. Gustav traveled to England in 1898 where he was first exposed himself to the European arts and crafts movement, returning to the U.S. to establish United Crafts which later became widely known as Craftsman Workshops. While in Europe, Gustav became familiar with the design philosophy of William Morris and John Ruskin. Stickley Brothers introduced Arts and Crafts style furniture to the U.S. market along with utopian work communities like Roycroft which had also adopted the clean and simple design principles of hand craftsmanship of the arts and crafts movement. Gustav first published The Craftsman magazine in 1901, a chronicle of the movement and its design principles. 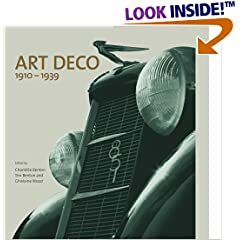 The Craftsman heralded the arts and crafts style in home design, decorating, and even gardening, becoming the best known and most widely read publication of arts and crafts design. Harvey Ellis was hired to write for The Craftsman in 1903, but he soon began working with Gustav to design a wider variety of the simple, finely crafted furniture and accessories for which Stickley Brothers is still known today. Where Gustav's designs were somewhat more substantial, Ellis retained the simplicity and fine craftsmanship while evolving a more comfortable, elegant style reminiscent of the Scottish designer Charles Rennie Mackintosh. 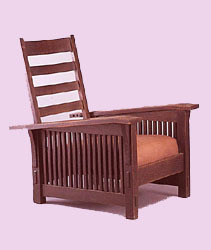 The labor intensity and limited market of Stickley designs coupled with the approach of World War I led to the bankruptcy of the company in 1915. At that point, his younger brothers Leopold and John George assumed Gustav's debts, took over his workshops and inventory, and formed the L & JG Stickley Company which still adhered to the design principles of Gustav's Craftsman Workshops. The L & JG Stickley Company followed the same principles of furniture design pioneered by Gustav, but they also fostered more sense of design freedom among their craftsmen which led to a more diverse production. By this time, many U.S. manufacturers were copying the Stickley designs, creating an entire industry around the "mission style" furniture as Stickley's work had come to be known. While Stickley furniture always had a degree of machine involvement in creating the design, Gustav and his brothers really looked to machining more as a precursor for hand crafted details. This balance provided the foundation of the American arts and crafts movement, where machines were used to a limited but productive degree in the furniture designs, bringing down the cost sufficiently to open up the market to the middle classes. 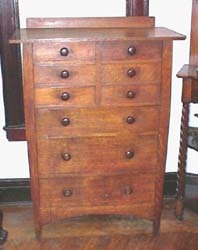 This is a distinction unique to the American movement, for in England any dependence whatsoever on machinery was shunned and made English arts and crafts designs too costly for most people. Designs were simple yet elegant, free from ornamentation and allowing the craftsmanship itself to show through in the structural elements such as mortise & tenon and tongue & groove joints in the furniture. The Stickleys always appreciated the inherent beauty of wood and leather, and they did not feel the need to embellish the cleanliness of the design. In 1974, L & JG Stickley was sold by Mrs. Louise Stickley to Alfred and Aminy Audi whose family still own and operate the company today. Alfred's father E. J. Audi was a close friend of Leopold Stickley and already successful in the furniture industry. It was believed by the Stickleys that the Audi family would maintain the high quality craftsmanship which had become so closely associated with their name. Indeed, many of Gustav and L & JG Stickley's designs are still made today in the Stickley Mission Oak and Cherry Valley collections. Buy period Stickley and other Arts & Crafts artists and manufacturers on the Collectics Fine Antiques pages, or search the entire site for great antiques, collectibles, and crafts for every collector! Sell or consign period Gustav Stickley, Roycroft, Dirk van Erp, and other finer American arts & crafts antiques at Collectics. Read about our top performing national consignment program for estate and personal collections.